SASKATCHEWAN – The Saskatchewan Rush Lacrosse Club in partnership with SaskTel are proud to announce a broadcast deal with local on demand provider SaskTel maxTV for Game 1 of the National Lacrosse League Western Final set for Saturday, May 14th vs the Calgary Roughnecks at the Scotiabank Saddledome. The game will be broadcast LIVE at 7pm CST, free of charge, for all SaskTel maxTV subscribers on Channels 49 and 349 HD. “It is fantastic to partner with SaskTel maxTV on this playoff game. This broadcast will allow for over 105,000 households across the province to witness history, as this game will mark the first ever playoff date in Saskatchewan Rush history,” stated Lee Genier, President of Saskatchewan Rush. Game two of this Western Final three game series will take place in Saskatchewan at SaskTel Centre on Sat, May 21st. Tickets for this game are now almost sold out. Fans can secure their tickets at saskrush.com. 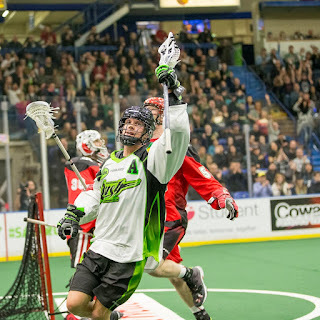 In the event the series is tied after two games, a ten-minute third game will take place immediately following game two in Saskatchewan to determine a winner of the series. This is great that Sask Tel is going to allow us that belong to Sask Tel a chance to watch the Rush play on TV. My question to Sask Tel is this .... "Why can't you also show Saskatoon Blades Games like SHAW does on Tv " ??? Nobody would watch the Blades.